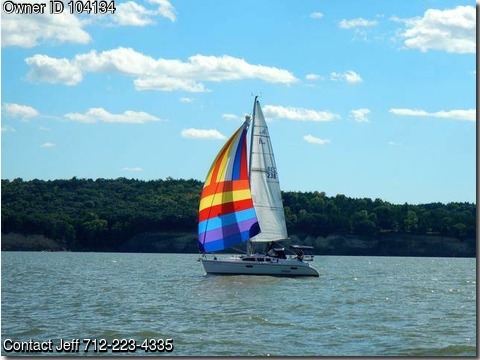 Boat is located in Yankton,SD.Please contact the owner @ 712-223-4335..New mainsail 2013, New headsail 2014, New cockpit cushions 2016, New Harken roller furling 2017, New batteries 2017. The stuffing box was repacked this year and the cutlass bearings were replaced. This boat is well maintained with bottom paint, polishing, and waxing annually. There is no damage or leaks. Includes spinnaker, whisker pole, winter cover, and cradle.